“I strongly condemn the terror attack that took place near the British Parliament in the center of London on Wednesday. I offer my condolences to the families of the victims, the people and government of the United Kingdom and wish the injured speedy recovery. The people of Kurdistan are in the forefront of the fight against terror and understand the wounds and pain caused by terrorism. It, therefore, stands with and sympathizes with the United Kingdom. This terror attack is yet another reminder that the international community needs more impetus to fight terrorism everywhere. It also needs further cooperation in this regard. We reiterate our heartfelt sympathy with the families of the victims and solidarity with the United Kingdom”. 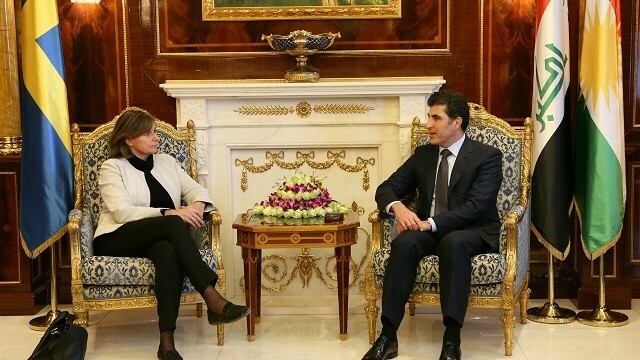 Erbil, Kurdistan Region, Iraq (cabinet.gov.krd) – Kurdistan Regional Government Prime Minister, Nechirvan Barzani met with Sweden’s Deputy Prime Minister Isabella Lovin and her accompanying delegation. In the meeting, attended by Kurdistan Region Deputy Prime Minister and a number of KRG ministers, the Swedish leader commended the Kurdistan Region for sheltering and providing services for nearly two million refugees and internally displaced people. She reiterated her country’s humanitarian and military support to the Kurdistan Region and stated that Sweden will also provide support to the areas recently liberated from the so-called Islamic State terrorist group. The Swedish leader was briefed on the reforms undertaken by the Kurdistan Regional Government, including measures taken to strengthen the private sector. 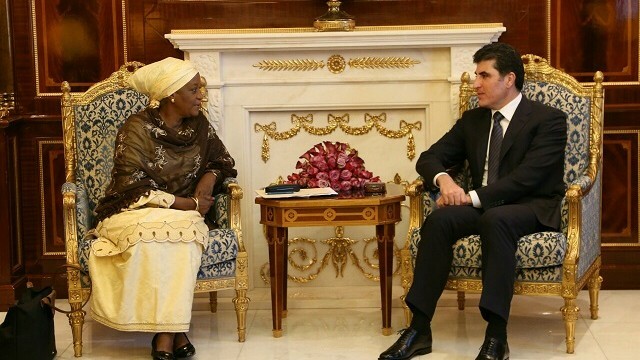 Erbil, Kurdistan Region, Iraq (cabinet.gov.krd) – Kurdistan Regional Government Prime Minister, Nechirvan Barzani received Ms. Zainab Bangura, Special Representative of the United Nations Secretary General on Sexual Violence in Conflict, and her accompanying delegation. Ms. Bangura expressed her appreciation for the collaboration and assistance offered by the Kurdistan Regional Government’s institutions to the UN organizations, especially in the field of work on women who have been victims of sexual violence. The United Nations has classified sexual violence committed against women in conflicts as war crime. Ms. Bangura also commended the activities of Women Support and Treatment Centre, established by the Kurdistan Regional Government, with the support of the United Nations in the Governorate of Dohuk. In this regard, she said, the United Nations intends to open two other centres, in the Kurdistan Region and Baghdad, for treatment of women, victim of violence and those freed from the captivity of the Islamic State terrorist group, ISIS. Praising Ms. Bangura’s activities in the field of combating violence against women, Prime Minister Barzani called for support to the KRG Ministry of Interior and High Council of Women Affairs to better address women-related issues in the society. He stressed that the KRG will continue in its efforts to combat violence against women, and is committed to offer all kinds of assistance in this regard. Other topics related to women condition in the region in general were also discussed. 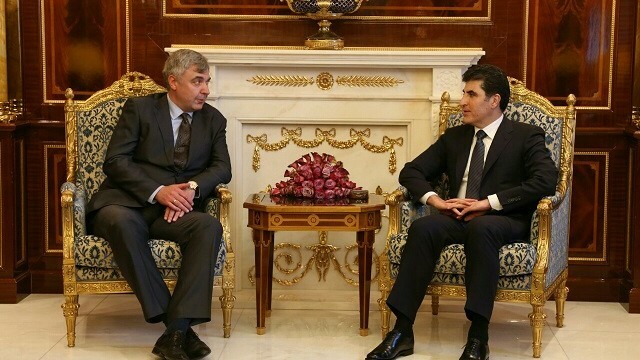 Erbil, Kurdistan Region, Iraq (cabinet.gov.krd) – Kurdistan Region Prime Minister Nechirvan Barzani met with the new Russian Ambassador to Iraq. The Russian Consul General in the Kurdistan Region, officials from Russia’s Ministry of Foreign Affairs, and a delegation from Gazprom accompanied Ambassador Maxim Maximov on his first visit to Erbil. The top Russian diplomat in Iraq called for further strengthening the relations between his country and the Kurdistan Region on all levels. Citing economic importance of the Kurdistan Region to his country, he urged Russian companies to invest in the Kurdistan Region, especially in the energy sector. For his part, Prime Minister Barzani highlighted the close relations between the Kurdistan Region and Russian Federation. He also said that the Kurdistan Regional Government supports foreign companies that invest in the Kurdistan Region and commended Gazprom for investing in the region’s energy sector. The two sides also discussed a number of pressing issues, including the fight of the war against the so-called Islamic State terror group and the ongoing operation to liberate the city of Mosul.